Besides having a mouthful of a name the Smith Dolen ChromaPop Polarchromic Ignitor sunglasses boast a ton of technology that is supposed to provide you with unparalleled visual clarity in a multitude of weather conditions – ranging from overcast to bright sun. I’ve worn a pair for almost a year now and they have secured a place on my nose for good. Here’s why. When it comes down to it this is really two reviews, one for the lenses and another for the frames, as you can get the ChromaPop Polarchromic Ignitor lenses in several frame types from Smith and you can get many types of lenses in the Dolen frames. Lets start with the lenses. Reading the product description for the ChromaPop Polarchromic Ignitor lense sounds like reading a technical manual but the features boil down to three primary results. They make colors more vibrant, they change VLT (visual light transmission) to match the brightness of the conditions and they are polarized. The ChromaPop technology is relatively new and (as it was described to me) works by filtering out the light wavelengths “between” true colors. This is what makes colors more vibrant. Anywhere a color blends some of the light is filtered out. In use I describe it as an Instagram filter for real life. I’ve heard many people complain about it portraying a fake world but I’ve been quite happy with the results. Sunsets look cool, a bright green meadow “pops” and, more importantly, I’ve found it’s super easy to spot the flash of a trout underwater as it goes for my hook. Unscientifically I’d say I’ve successfully set hooks on striking fish using these sunglasses. The fact that they help me spot fish so well really lends itself to the next feature, their ability to change VLT from 12 to 20 percent to match the brightness of your surroundings. While this is great for a multitude of uses (such as hiking or biking in the Pacific Northwest where you can go from bright sun to clouds quite quickly yet still have “glare” that makes you squint) its, again, while fishing that I really appreciate this feature. I can spot fish so much more easily that I don’t want to take these sunglasses off when it’s cloudy and the switch from 20 to 12 percent VLT allows me to keep them on without even noticing that the sun has gone away. Huge fan. I’ve used several other VLT lenses in both ski goggles and sunglasses and the Polarchromic lenses from Smith rank on the better end of the spectrum. Outside of those two standout features the final one worth mentioning, their polarization, is excellent. Works as expected in many scenarios from fishing to sea kayaking to bright sun on a glacier. The biggest drawback of these lenses is their scratch resistance. While they boast that they have “unparalleled scratch resistance” I found that I needed to be exceptionally careful with them. If they brush up against your keys or accidently drop on the ground you are going to get a big old scratch. This is pretty disappointing from a pair of $240 sunglasses. Check out that dude wearing those stylish sunglasses! 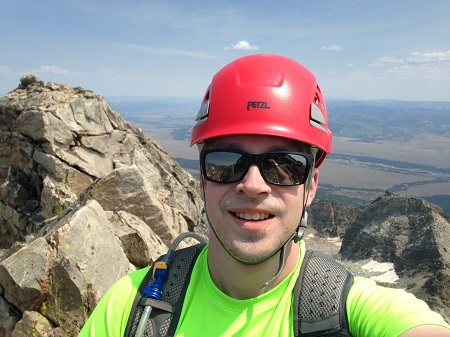 I’ve worn the Smith Dolen ChromaPop Polarchromic Ignitor sunglasses from sea level kayaking the San Juan Islands up to 12,000 while climbing Buck Mountain in the Tetons. They preformed great in all scenarios. Moving on to the frames. I like the look and fit quite well. Since these sunglasses are so expensive I appreciate that they don’t look to “sporty”. I can wear them around town and look classy but still wear them into the wilderness and get the coverage I need thanks to a slightly larger than average lense size. They are also slightly wider than normal so if you have a medium sized head or larger they will probably fit comfortably. Narrow heads should probably look elsewhere. My biggest complaint is how weak the hinge on these frames are. What I mean by this is how “locked” they are when open or closed. This becomes apparent when you have them closed and hooked over the front of your shirt and go to bend over to tie your shoe. The arm will pop out into a strait position causing them to release from your shirt and fall off every single time. This is a mild irritation generally but considering how scratch prone the lenses are it becomes really problematic. You will, at some point, forget and bend over and the Dolen’s will fall from the front of your shirt and get scratched, I guarantee it. The combination of Dolen frames and ChromaPop Polarchromic Ignitor sunglasses have served me quite well. They are my go to pair of sunglasses for literally every activity and this is coming from someone who has sensitive eyes. But, when buying a pair you must accept the fact that you will scratch them and you will be sad. This entry was posted in Activities, Activities, Alpine Mountineering, Activities, Backpacking, Brands, Activities, Car Camping, Activities, Fishing, Gear, Activities, Hiking, Product Review, Activities, Resort Skiing, Activities, Sea Kayaking, Activities, Ski Mountaineering, Brands, Smith, Gear, Sunglasses, Activities, White Water Rafting.